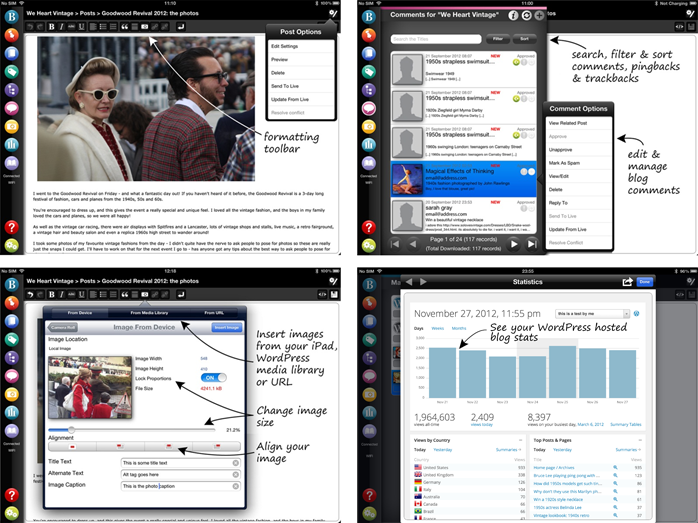 BlogPad Pro is the most professional blogging app for running ALL your WordPress blogs from your iPad. Blog online, in airplane mode or when you don’t have an internet connection – just sync your changes when you’re done! Version 1.3 of BlogPad Pro has just been released and is packed with new features, improvements and bug fixes. Read more here. This is a good idea. Any chances of launching an Android app? Love the idea Mary! Can’t wait to try it out. How do I move pictures to set them out nicer in a blog?.??? This allows you to resize your image, choose how to align it and whether you add a caption. I think that Jeanet also meant how to set the margins on on image. That is at least something I would like to see. Thanks for your comment and email. I tried to reply to your info@ email address but it doesn’t seem to work. I’ve replied to your other email address, please let me know if it doesn’t come through! thanks! I learned to blog with BlogPad Pro. Downloaded it via App Store a few days ago and IT IS AMAZING. Not all my functions are working. Am I doing something wrong? I want to use the pictures from my iPad and the only option it is giving me is to post forms URL. I’ve tried emailing you but your email address doesn’t seem to work. Please email me at support (at) blogpadpro.com so I can help! I have downloaded the application and find it very fantastic to use. Thanks for this post, i will definitely bookmark this for future reading.